Your satisfaction is our first priority. Company representatives strive to provide the best yard and lawn care services possible at prices that are truly competitive. Customer satisfaction is the ultimate goal. Ryno Lawn Care in Lewisville, TX Offers Weekly Lawn Care To Keep Your Lawn In Top Condition! Consistent weekly lawn care is the best way to keep your yard looking great. Many people mistakenly believe that it’s best to cut grass thoroughly occasionally. The best thing to do is simply trim a quarter-inch weekly. This method helps your lawn grow properly. 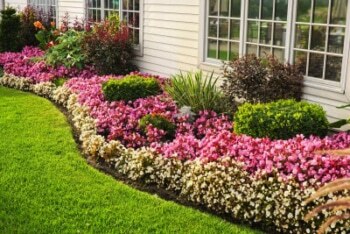 Your yard will always look freshly manicured with regular trimming. Lewisville lawn care service keeps your yard looking beautiful and allows you to enjoy your yard without backbreaking labor. Ryno Lawn Care, LLC professionals will visit regularly to trim, manage weeds, edge and blow debris away. Prices vary depending upon the size of the yard and the type of landscaping. Your Ryno Lawn Care, LLC professional will provide you with an estimate after your initial consultation. Are you wondering why the grass in your lawn turning yellow? We are happy to provide a free Lewisville Lawn Care, comprehensive estimate to every customer. Simply call 214-728-8894 or fill out the convenient online request form to schedule an appointment for your free yard and lawn care consultation. Ryno Lawn Care, LLC offers competitive prices tailored to meet the needs of each property and each client. Contact Ryno Lawn Care in Lewisville, TX today to learn how you can get the very best professional lawn care services at truly competitive prices.